A new report reveals that California’s increased reliance on groundwater pumping is causing Central California to sink much faster than officials estimated. The report, released today, shows that in just eight months last year, the Kings County town of Corcoran sank nearly 13 inches, while in Merced County, the unincorporated community of El Nido sank roughly ten inches. 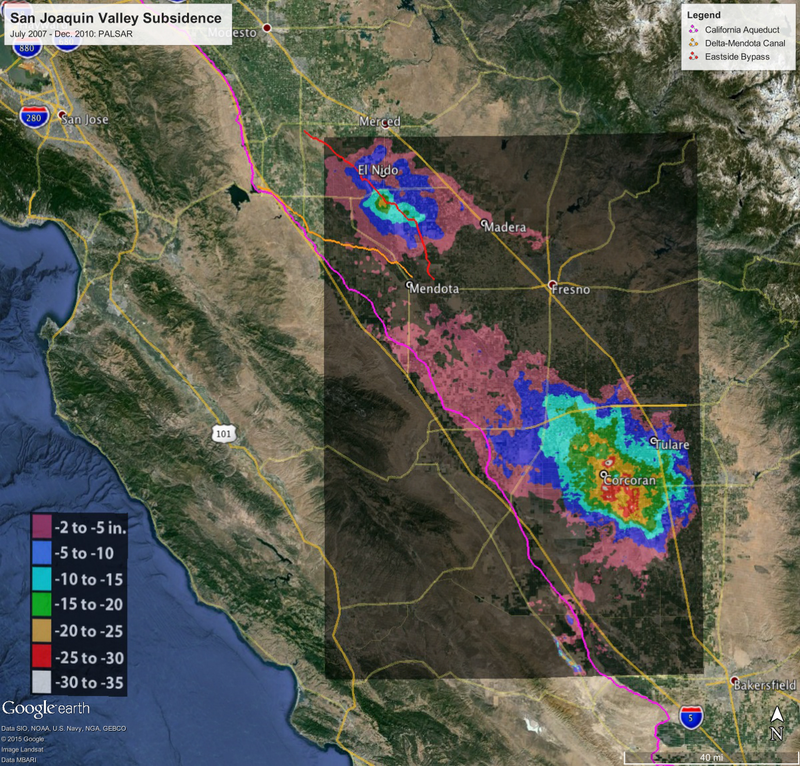 The report from NASA’s Jet Propulsion Lab used satellite imaging to capture elevation data, and was commissioned by the Department of Water Resources. This sinking of land, known as subsidence, is a known consequence of groundwater pumping and a problem that California’s been dealing with for decades. But it’s gotten worse as the state’s become drier. In the entire three years of drought that ended in 2009, Corcoran sank three feet, El Nido close to two feet. “The thing that particularly stands out for us was the increasing rates of subsidence that we saw in the most recent time period,” says the department’s Deputy Drought Manager, Jeanine Jones. Subsidence occurs when water is drawn out of underground aquifers. Within an aquifer, water is held in permeable sediments, and when it’s pumped out, the grains in the sediments compact. Without recharge from rain and snowmelt, Central Valley aquifers are slumping, as Californians rely more and more heavily on groundwater for drinking and irrigation. The subsidence poses a problem for the state’s infrastructure. 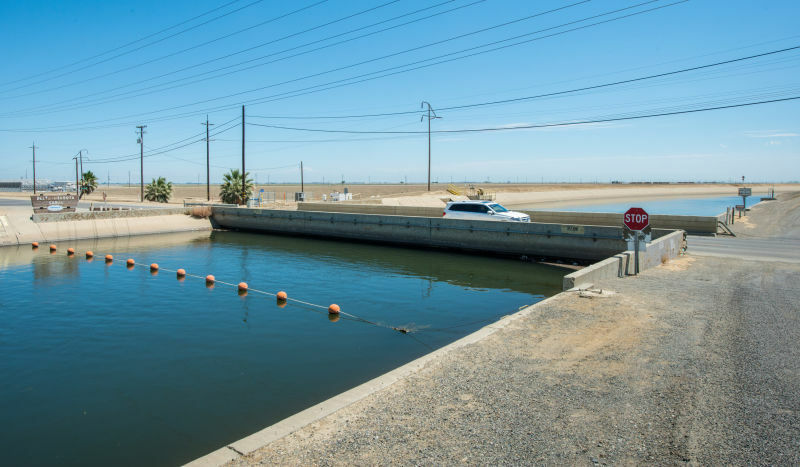 Roads can buckle, building foundations can crack, and officials worry about the California Aqueduct, a long canal that snakes through the valley to deliver water to Southern California. The report found that a stretch of the aqueduct has already subsided between eight and 13 inches. Jones says the state is beginning to talk with county governments about what they can do to reduce groundwater pumping and slow further subsidence. Glenn County, for example, recently put a 6-month moratorium on new well permits. Water Resources department director Mark Cowin acknowledges that finding solutions will take time. The department will also be making $10 million available to counties with stressed groundwater basins, to beef up water conservation. Kerry Klein comes to The California Report by way of the Science Communication graduate program at U.C. Santa Cruz. A geologist by training, Klein previously worked in the mining and geothermal energy industries. After transitioning to journalism, she worked for the Science Podcast, Valley Public Radio, the San Jose Mercury News and the Salinas Californian, reporting on drought, agriculture, space and roadkill.